You can use the ignition key to switch on the ignition and start the engine. – Insert the key into the ignition lock. – Automatic gearbox: Press the brake pedal and move the selector lever to position P or N.
– Press in the key ⇒ fig. 130 to start the engine. If you press in the key without pressing the clutch or brake pedal, the ignition will be switched on or off. The steering lock is released when the ignition is switched on. Diesel engines continue to be automatically preheated. The key can be removed only when the ignition is off. The key has to be pressed in briefly to switch off the ignition. On vehicles with an automatic gearbox, the selector lever has to be in position P.
Electrical components with a high power consumption are switched off temporarily while you start the engine. If the engine fails to start immediately, the starter will be switched off automatically after a few seconds. Try to start the engine again. This message appears on vehicles with an automatic gearbox if you try to start the engine without first pressing the brake pedal. This message appears on vehicles with a manual gearbox if you try to start the engine without first pressing the clutch pedal. This message will appear if you try to start the engine when the selector lever of the automatic gearbox is not in P or N.
For safety reasons, this message will appear and a warning buzzer will sound if the selector lever of the automatic gearbox is not in position P after you switch off the ignition. Put the selector lever in position P; otherwise the vehicle can roll away. If the lever is not in position P you will not be able to lock the vehicle using the exterior locking switch on the door handle or the remote control key. The steering is locked when the key is not in the ignition. The steering lock acts as a theft deterrent. • Always take the key with you when you leave the vehicle. Otherwise the engine can be started or power-operated equipment such as the electric windows can be used. This could result in serious injury. • Never leave children or disabled people alone in the car. The doors could be locked with the remote control key and the occupants could become trapped in the vehicle. The vehicle occupants could be exposed to extremely high or low temperatures, depending on the time of year. • Never remove the key from the ignition while the vehicle is moving. The steering lock could engage suddenly, and you would not be able to steer the car. • If a malfunction occurs in the electronic ignition lock, a flashing symbol and the message Ignition lock defective will appear in the instrument cluster display. Do not warm up the engine by running it with the car stationary. You should drive off immediately whenever possible. This will help avoid unnecessary exhaust emissions. • If the key should become stuck in the ignition lock, remove the top part of the key and use it to lock the vehicle. 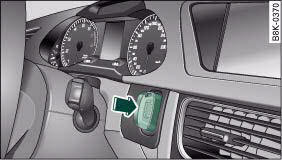 • If you open the driver's door while the ignition is switched on, a warning buzzer will sound, and the message Ignition is on will appear in the display. In this case, please switch off the ignition.